Nearly every Chicago suburb celebrates the summer season with a series of street parties. Wouldn’t it be nice to do something different this year? Why not have a pig roast? That would be something for the whole village to talk about! It’s much easier than you might think. Heybeck’s has been doing hog roasts for years, so they have everything down to a science. Heybeck’s has six shiny, black street-legal charcoal/wood-fired grills just waiting to be fired up to slow-roast that succulent pig. Heybeck’s can also provide tasty side dishes if you would like. Pig roasts are popular events, so try to plan your party early to ensure that a grill will be available on the date you want. Peak season for Chicago-area Pig Roasts is from May to the end of October. We’ve mentioned street parties, but pig roasts are also a terrific choice for family or class reunions, company parties, charity events, or any other large outdoor gatherings. Contact Brooke Buccola to schedule or learn more about a pig roast. Or for quick menu options and pricing, please visit our BBQ / PIG ROAST CATERING MENU AND PRICING page. Another outdoor grilling option that offers something special is Heybeck’s “Steak Venue” also referred to as THE CHEF’S TABLE. For this we have a larger gas-fired grill that gets really hot to sear your steak and cook it just the way you like. Or you can choose the “Sandwich Faire,” which requires the same specialty grill. To learn more about these choices, contact Catering Director Brooke Buccola. 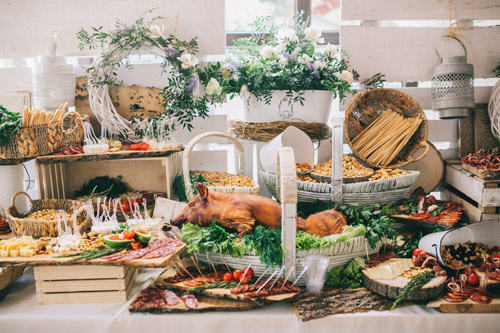 Visit our Catering Service Frequently Asked Questions (FAQs) page for more detailed information on pig roasts, outdoor grilling options, and value-added services we provide for your special event. Visit one of our affiliated Chicago-area stores or call today!